American horror movies in general perceive ghosts as the means to design special effects whose visceral power provokes the viewer to jump in their seats. The European supernatural/ghost films, however, take a different approach. Those films views ghost as the revival of terrifying history (personal or collective) trying to embody itself in the physical space of contemporary world. The ghost represents the need to recognize the past atrocities by the current generation and in turn set the moral account straight. Seen from this perspective, a ghost inquires a society’s collective conscience and unless the dreary past is accepted, the restlessness may continue, despite the Rabbi or priest’s call for exorcism. Mexican film-maker Guillermo del Toro’s The Devil’s Backbone (2001) unfurls in a Spanish orphanage which is equally haunted by the Spanish Civil War and the ghost of a murdered young boy. French film-maker Olivier Assayas’ latest film Personal Shopper treats the spectral presence as the haunted memory of a dead loved one. In the similar vein, late Polish film-maker Marcin Wrona’s Demon (2015) defines the ghost or ‘dybbuk’ (from Jewish folklore) as a figure that emerges to prod at a society’s buried greater evil. Marcin Wrona’s ambiguous horror film opens in the narrow streets of a deserted Polish island town where a bulldozer navigates its way through in an eerie, mysterious fashion. The huge vehicle’s march indicates that a dark secret will be unearthed. On a subtle note, the march may denote the resurfacing of the violent history. Demon was shot in a town named Bochnia, near Krakow, which once happened to be the center of Jewish culture and life. The holocaust purged the Jewish population and the vibrant, diverse lifestyles. Demon fleetingly observes the xenophobia that’s sprung on the grave of collective memory of the crimes committed against the ‘others’ – including Jews. The shot of the bulldozer is cut to a ferry which carries the film’s protagonist Pyton (Itay Tiran). Pyton aka Piotr has traveled from London to the Polish village to marry his fiancee Zaneta (Agnieszka Zulewska). Piotr wonders why the bridge that once ran into the village, blown by Germans in the war, hasn’t been rebuilt. As his ferry enters the village shores, he sees a partially covered woman splashing in the water and screaming. The march of bulldozer, the ferry ride on the vast expanse of water, and finally the shot of a rock quarry sets up a pensive mood as if something has been disrupted by Piotr’s arrival. Piotr is working as an architect in London and his marriage to Zaneta was brokered by her elder brother Jasny (Tomasz Schuchardt), a tough guy who is committed to his family. 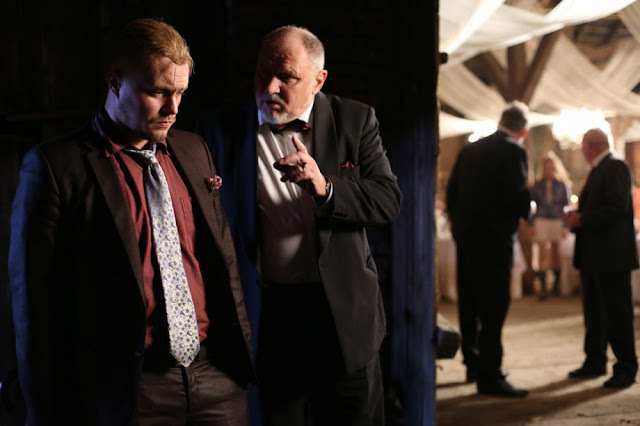 Initially, Piotr meets his future father-in law Zgmunt (Andrzej Grabowski) at his construction office and says he will rebuild the bridge to connect the village to the mainland. Zgmunt looks like an affable guy but he treats Piotr as an outsider and little wary about his son and daughter’s choice. The large part of the narrative is set on the estate which Zaneta has inherited from her grandfather. However, the house and the land around it have long been neglected. Piotr and Jasny consider making renovations after the upcoming two-day wedding celebrations. Jasny suggests a swimming pool and hence the yellow dozer appears. Piotr takes a tour of the house where he sees little markings on the wall. It may be the names of people who lived here in the past and one name occupies Pitor’s mind – Hana. On the eve of his wedding, Piotr stumbles upon the remains of a human being buried at the exact place where he planned to build the swimming pool. Piotr decides to keep it as a secret, at least until the wedding party ends. The wedding ceremony peacefully finishes the next morning. The couple arrives to the estate’s spacious barn, which has been decorated with white drapes and fanciful lights to commence the vodka-driven wedding party. And, not long before, Piotr catches sight of Hana the ghost, cloaked in a wedding dress. Considering the debauchery of Polish wedding party, it’s not clear whether Hana’s manifestation was real or just a hallucination. As the partying gets more intense, Piotr starts to violently twist and writhe. The list of drunken party attendees includes a delirious doctor (Adam Woronowicz) who writes off Piotr’s illness as an epileptic fit. Zaneta is worried over Piotr’s well being, whereas her grumpy father Zgmunt hopes the guest doesn’t start up rumors so as to ruin the family's reputation. Piotr is now confined to a dingy basement room accompanied by Zaneta and an old local professor who once knew and loved Hana. Soon, Piotr starts talking in Yiddish. Outside a storm rages which naturally doesn’t affect the fervent drinking of guests. Amidst all the sadness, Zgmunt and his boozy guests are cloaked in an atmosphere of denial. When the father at a later point says, “We must forget what we didn’t see here”, the words doesn’t just speak about Piotr’s predicament, but also about the repression of disastrous past. Demon is Wrona’s third feature film (his first two films – My Flesh My Blood (2009) & The Christening (2010)) is inspired by Jewish mythology (of dybbuk) and driven by fascination for chaotic Polish wedding rituals. And, like recent horror tales Under the Shadow it substitutes the ambiguous horror context with complex historical context. The script co-written by Pawel Maslona is based on the play by Piotr Rowicki. Among the legends about ‘Dybbuk’, the 1937 movie of the same name, based on Ansky’s famous play was an important work. In Wrona’s movie the dybbuk not only haunts the groom (instead of bride in the original), it tries to unearth the ignored ‘demons’ of the past. 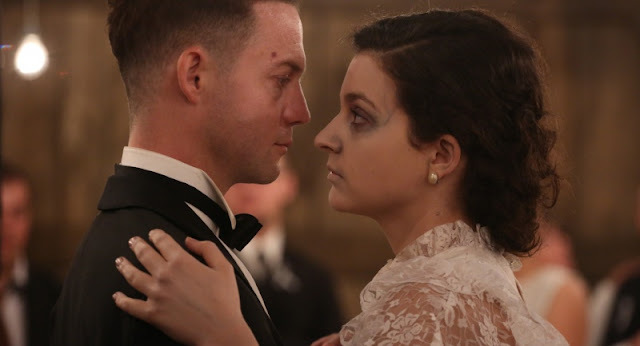 The legendary long Polish weddings have previously been the subject of Smarzowski’s Wesele (2004) and Andrej Wajda’s The Wedding (1973), based on Stanislaw Wyspianski’s celebrated 1901 play. Similar to those films, the staging of wedding party perfectly captures the bizarre hysterical behavior which trumps over the trappings of good manners. The folk music, the drunken revelry and the rustic rural setting still remains timeless. As usual the madness of the Polish wedding ritual is entwined with dark humor. In the desperation of bride’s father we could perceive the truth about all marriages which is the attempt to escalate celebration to mask our fears and vulnerability. Director Wrona brings impressive assortment of strange behavior and absurdism over the long wedding ritual. Despite the absurdist streak and a straight horror plot, Demon is a one of the very sad movies to delve into the nature of collective guilt. And, the simple horror story never ends up giving simple answers. The story as it progresses disguises metaphorical meanings deep within the simple surface. As I mentioned earlier, the massive denial of the wedding guests could be related with ignorance of masses in the totalitarian set-up. For, the hung-over guests, waking up the next day, the whole sad episode would be a fantastical dream that’s easily forgettable; similar to how the societies remain dazed after denying traumas of the historical past. Demon may also work for open-minded viewers who aren’t much aware of complicated backstory and metaphorical meanings. Cinematographer Pawel Flis’ impeccably blocked shots keeps up the mysterious tone till the end. Moreover, the visualization of foggy dawns reminds us of having been caught inside series of nightmares. Eventually, the undeniable grief related to the film is the death of director Marcin Wrona (committed suicide). The Toronto Film Fest organizers hailed Demon as “the emergence of a strong new voice on the world cinema stage”. It’s a sad ending to a film-maker who has elegantly re-defined the nature of horror and ghost.